Vegan Rajagro Siro/Halwa - vegan amaranth pudding is insanely delicious Indian dessert that comes together in a few ticks in less than 15 minutes. This rich, melt in your mouth dessert is loaded with dry fruit and suitable for a gluten-free diet. Ideal during fasting seasons such as Navratri, Shravan mas or Ekadashi. Although it is prepared and enjoyed on Indian festivals such as Navratri, Shivratri, Janamasthmi or Ekadashi, you are more than welcome to indulge on any regular day too. 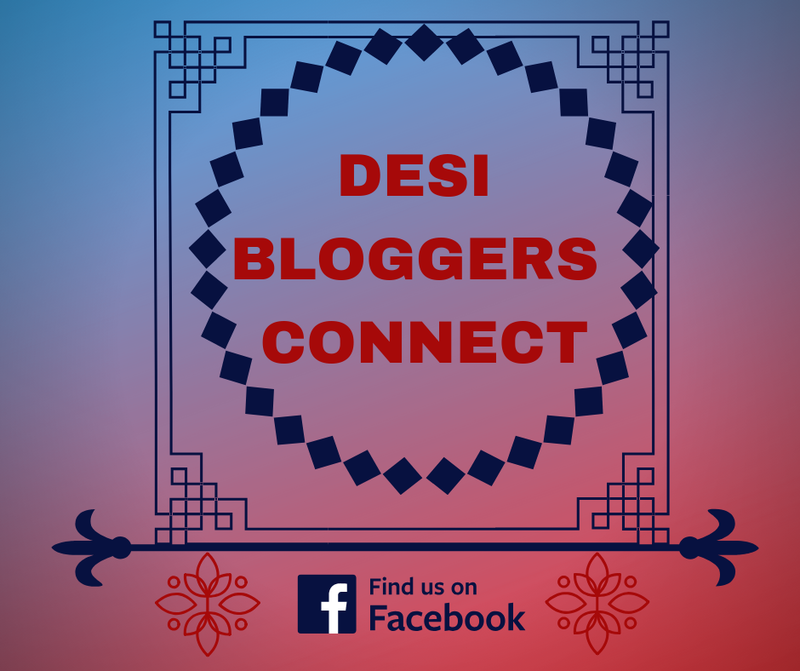 WHAT IS SIRO OR HALWA? Siro or Halwa is a typical Indian sweet/confection or dessert made of flour (various kinds) fruits or vegetables, with milk, sugar, nuts and fat such as ghee. Indian Halwa is no way near to Halva which you can find in greek or Israeli shops. It is a pudding consistency and made by roasting flours in ghee or fruit and veg stewed in milk over stovetop until thick and creamy and eaten with the spoon. 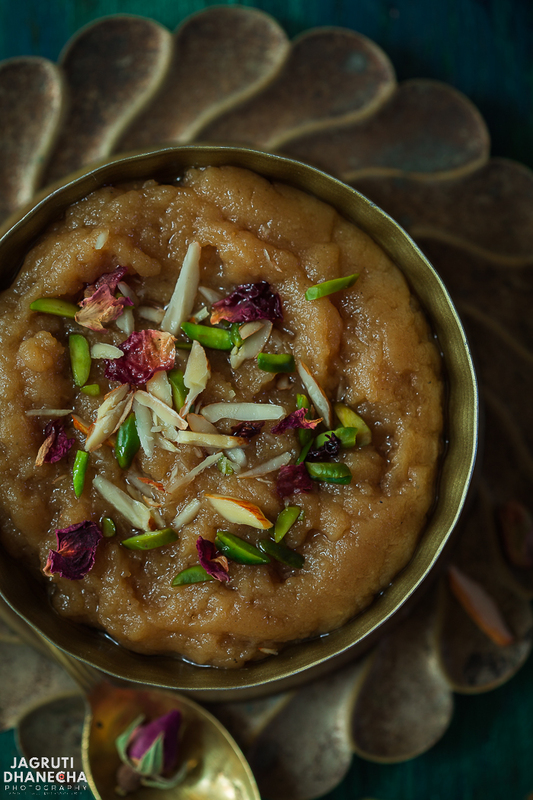 In Indian households, Siro or halwa is not an everyday dessert but reserved for solely special occasions and small celebrations, however, one can make a simple one like this in a jiffy to please their sweet cravings. Rajagro/Rajgira Siro is an authentic Indian dessert made of rajagro-amaranth flour. 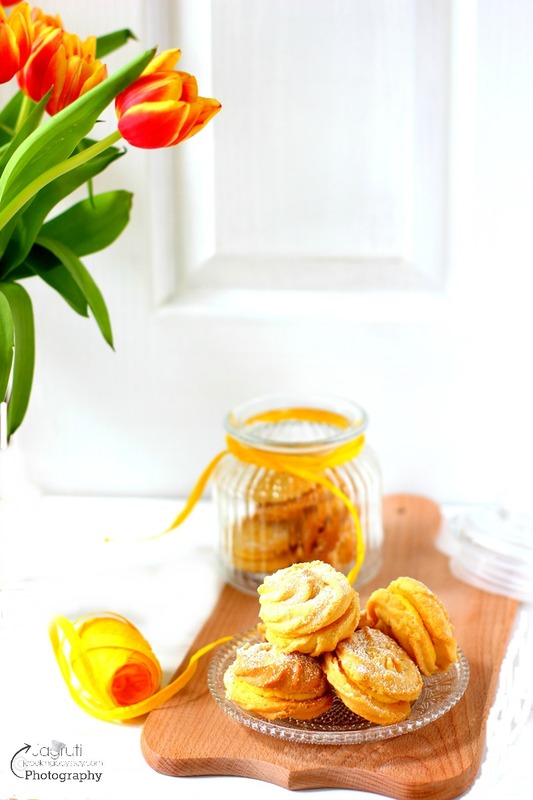 Usually, the flour is roasted in ghee, ( in this recipe I have used coconut oil), combined with sugar and flavoured with cardamom and spiked with slivered nuts and dried edible flower petals. This melt in your mouth dessert is often prepared during the fasting season. It can be paired with Farali dum aloo, Farali Kand/Ratalu Bhaji and Farali Masala Buckwheat (Kuttu) Poori. The best thing about this recipe is that this dessert is almost an instant and it is made only with 3 ingredients to wow anyone. HOW TO MAKE VEGAN RAJAGRO SIRO/HALWA? Like I said above that this dessert is almost an Instant and done in a jiffy as there is an only one step recipe. Start roasting the flour in coconut oil until you see the flour changes colour to light pink and flour releases the tempting aroma add hot water, add the sugar and mix everything for a delicious, aromatic and luscious siro or halwa. Soft, smooth and just melt in your mouth siro is ready to devour. Vegan RajgaroSiroo tastes best when served hot or warm but not cold. Another reason to serve warm because in cooler weather coconut oil hardens. It can be consumed on its own or serve alongside a farali meal. Farali Vegan Rajagro Siro or Halwa-a Gujarati style fasting Indian dessert prepared with Amaranth flour. Heat coconut oil in a heavy bottom pan, add flour. Roast the flour until it goes pink and roasting aroma starts wafting. Por hot water and keep stirring the mixture until all the water evaporates. Now add sugar and mix so well until sugar melts completely and halwa gets a beautiful shine to it. 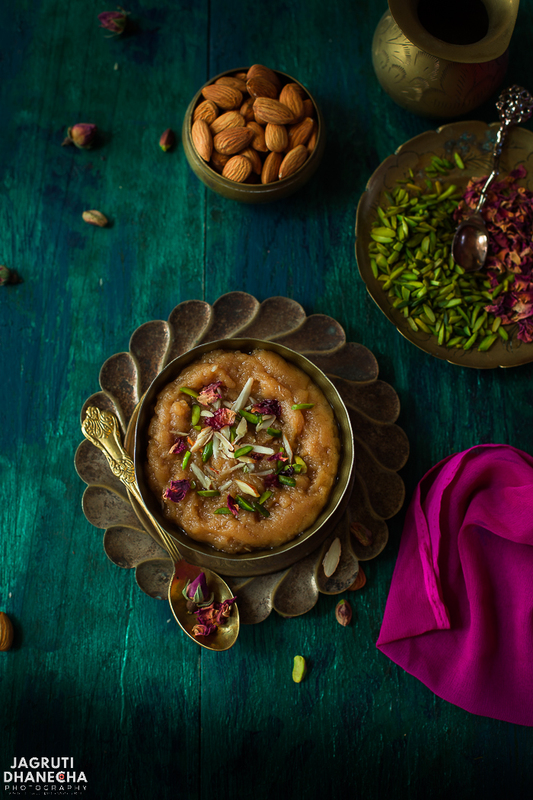 Serve in a serving bowl and garnish the siro/halwa with nuts and rose petals if using. Instead of water, you can use plant-based milk. If you wish to make vegetarian siro, then use ghee instead of coconut oil. 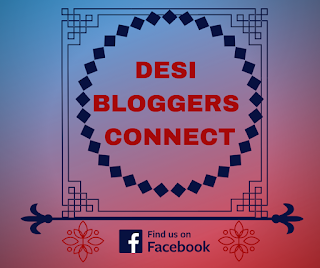 This recipe is created for event #faralatdesibloggersconnect, a Facebook group Desi Bloggers Connect. 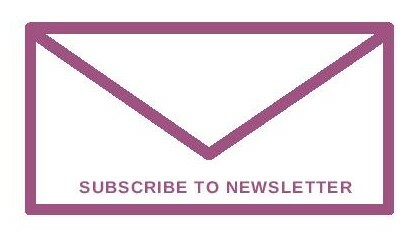 Have a look at other members recipes below. OMG, jagruti, that ghee floating halwa is so much tempting! Love the styling!! i have made savories with rajgira, yet to try halwa, i m definitely bookmarking this to try! Rajagro shiro is my favorite and you're so right it comes together in a matter of a few minutes. With coconut oil instead of ghee it must be tasting a bit different, with a coconut flavor. Lovely clicks. How lovely to use Amaranth for making Shero/halwa. I so love this grain Jagruti. I am definitely going to try this. I cannot take my eyes off these visuals! Such a simple sheera and you have made it look like you have slaved over it for hours! Love this idea of using coconut oil instead of ghee! Beautiful, delicious and why Navratri, I can have it every day! I would fast for this delicoius Rajgiro Halwa. Looks spectacular too! I love a simple dessert and this is wonderful! I love that it uses coconut oil and nuts- it has such great flavor. Love this vegan version of pudding with amaranth flour, looks so festive. 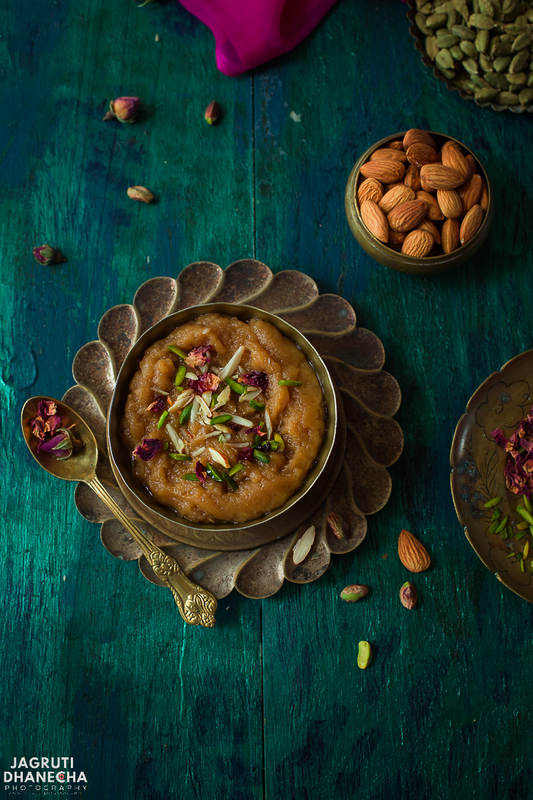 Love this vegan version of halwa with amaranth flour. It looks so festive Jagruti. This is just stunning, I've never heard of this dessert but your description has got me fascinated! Mmm I love Indian desserts so will definitely need to try this! Yumm!!! This looks so good. I wonder how similar it is in taste to something in Albanian cuisine we call Hallva. I'll have to try it out. Your recipe for vegan rajagro sirohalwa looks delicious, thank you!! Wow! Delicious Halvo. You hvae made a totally traditional dish in a Vegan version. Hats off. Jagruti. I love it. Wheat Germ Mocha Cream Cookies ~ Merry Christmas !